After I made my first Samara cardigan, I ended up wearing it all over the place (this is ongoing). It dresses up and down very well, and the pattern/colour combo works great with my wardrobe. As that relates to this Samara, I wore the first to Lugo, a Saskatoon arts event, where I met Shawn, who was very sharply dressed. We got to talking, and he asked if I'd make him one, but with some batik he'd brought back from Indonesia, which, absolutely! I'm calling this a kimono although obviously it isn't truly one, but that's what Shawn and I kept calling it, so that's its name. This one was a dream to sew. Doing a pattern for a second time is always nice, but doing it in easier to manipulate fabric? Yesssss. Plus, this fabric is gorgeous. It has a great border print, a woven-in texture (which I want to call jacquard, but it's just a raised pattern with no relation to the printed pattern), gorgeous colours, great drape, and selvedge along three edges. It was a genuine pleasure to work with. kitchen progress shot. so glad i didn't have to cut that bottom off!! This stuff was super long selvedge to selvedge. I didn't measure but about 2.5 m, so it didn't matter that there was only 1 m lengthwise. Before I got my hands on it, Shawn and I had actually discussed using a couple of his Indonesian cuts, as he'd bought them all in 1 m lengths. I'm really pleased that that wasn't necessary, but it was very tight to get everything cut from one. I'd toyed with matching the diagonal stripes, perhaps in some kind of arrow pattern at the back, but that was also out due to the limited-ness of our fabric. I don't mind one bit the simpler candystripe layout. He wanted the cardigan to come just above his knee, which also worked out just right, as I was just able to cut the pieces along the 1m length and use the border print. I love the effect. Because this bottom edge was selvedge as well, I only folded the hem up once, so that the selvedge would still show on the inside. I'd been prepared to shorten if need be, but thankfully my measurements for him were spot-on. However, I'd cut the lapel from the cardigan pattern like a silly person, leaving me a little short. So I added in a contrast center back lapel piece, which I think looks hella planned and hella nice. The other personalized detail Shawn wanted was an inside pocket for his phone etc, as opposed to a patch pocket. I proposed the idea of an in-seam pocket, but he really wanted an inner chest-pocket. 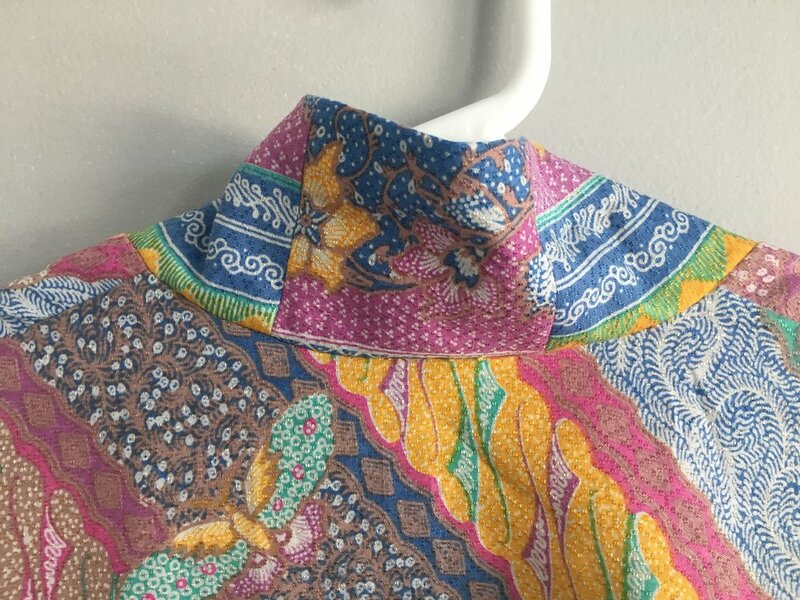 I was a little nervous about this as we didn't want to bulk up the lightness of the kimono-robe with a lining, so this pocket was going to be stitched right onto the body, and the last thing I wanted was eyesore stitching sticking through! In the end, thanks to the pattern and some great-matching thread I had on hand, it's practically invisible and highly functional. For my own pleasure, I used a scrap from the side selvedge for this bit, and again left the selvedge bit visible. I think it looks lovely, and I love the dark muddiness of that edge. This time around, I followed my own advice and actually remembered to include the belt loops! Which is good because a) this think is meant to be worn as a robe (specifically for sipping mimosas!) and b) French seams. Ain't nobody wanna undo their french seams to put belt loops in. Kind of wildly in love with the inside out view of this one. And that's it! Shawn was super happy with the finished product, and of course I pointed out all the little finishing details to him so he can enjoy them as much as I did. I'm a little sad not to have this lovely fabric kicking around anymore/this lovely robe hanging on my wall, but it's with its owner and that rules.